HOUSTON  The addition of Crosby and parts of the southern portion of Huffman ISD to Harris County Precinct 2 did not leave a distinctive enough advantage to elect a Hispanic to Harris County Commissioners Court according to a law suit that wrapped up testimony on Nov. 16. U.S. District Judge Vanessa Gilmore made the interum Commissioners map and busted the county up into four County Precincts of about a million residents each. The redistricting map adopted last year by the state legislature for Harris County Commissioner Precincts is now being alleged to weaken Hispanic voting power in Precinct 2 and therefore is illegal according to the Voters Rights Act, according to a suit filed by James Rodriguez (Houston City Councilman) and Ed Gonzales. They are being represented by Chad Dunn, the general council for the Democratic Party. George W. Bush resigned the Voters Rights Act during his second year in office as President, it is known to be the most lawsuit based law ever enacted. Redistricting based on the 2010 Census was to make many changes to the local legislative representation costing Crosby U.S. Congressman Ted Poe, R.02, and Dan Huberty, House District #127, beginning this January. But the suit concerns the County Precinct that was lost by Democrat Sylvia Garcia to Jack Morman in 2010 by a 51% to 48% vote. She was the first Hispanic on the Commissioners Court. Sylvia Garcia has testified and helped organize opposition to the Countys map. The same Precinct voted for Adrian Garcia over Louis Guthrie by 54.1% or 17,000 votes in 2012. The change of adding the new areas in Crosby and Huffman gave a 1% more conservative change to the voting population. The new interum map used during the 2012 elections was cited to be a 40.4% Hispanic population of voters. Precinct 2 was to absorb all of the east of Houston while the 2010 Census showed the North and West portions of the county growing businesses, wealth and populations. Precinct 2 was being dubbed a Hispanic Opportunity District. The plaintiffs in the suit want Precinct 2 to be declared a protected minority opportunity district related to the Voters Rights Act. The plaintiffs must prove that their contest of the ruling and the legislation was not based just on political party but then the plaintiffs had Matt Barreto of the University of Washington flown in to testify that it was impossible to disentangle race from party affiliation in the South. Sylvia Garcia took the stand on Nov. 15, saying I think discrimination still exists. It just may be more subtle, its more creative, more clever, but it is there. She would add that local and State governments dissuage Latinos from participating in the political process. The interim map of Harris County Precincts was drawn by Judge Vanessa Gilmore so that the elections could continue. Chad Dunn grilled Dave Walden of Precinct 2 why Walden requested information on prevalence of straight ticket voting, ethnic make-up and voter turnout in various voting precincts within the County Precinct 2. Some Houston residents may get a chance to vote for Sylvia Garcia in the Special Election S.D. 6 to be called in the next two months, before she can re-challenge Morman for Precinct 2 in his reelection bid in 2014. CROSBY  Nov. 19 the newly elected members of the Crosby ISD Board and returning members quickly reorganized to make John Lindsey President, Dan Kasprzak Vice President, Carla Mills-Windfont Secretary and JoAnn Crawford Assistant Secretary. The addition of Dr. James Hofmann Single Member District 7 and David Porter for Single Member District 5 as Trustees was accomplished after votes were canvased. One of the greatest accomplishments a school board can make came into being last year when the board refinanced part of their last bond and saved 26%, now they have moved to refinance the rest of the outstanding sinking debt to (depending on how the market swings) save about $3 Million for the district. The bond refunding plan (begun by JoAnn Crawford) passed 7 to 0. It adopted an order authorizing the issuance of refunding bonds, establishing parameters for the refunding and delegating authority to the Superintendant. The board promptly moved to begin consideration of buying 70 acres of land out of a 264 acre tract in the Humphrey Jackson League on the West side of FM 2100. They also approved related items. An expression, fixing to get ready, applies here  they did not approve buying the land, but to being looking at buying the land. They cleared the process to put a contract on the land to be purchased and due diligence will begin to examine the land soon. This began the 90 day opt out period. A company was hired by the board to examine land purchases. This land is being contracted to possibly be aquired for the districts future needs no matter what decision will be made about a high school bond or other decisions. A finance expert discussed with the board the implications for proceeding with the bond now when interest rates are at their historic lowest. His report detailed the fiscal stability of the district to move to borrow the money at current rates and the historic stability and efficiency of the Crosby district related to funding schools. Dr. Moore explained that obtasining this land will be helpful to the district in the future no matter what decision it makes on the current bond question that at this time is being reviewed by a Citizens Advisory Committee. The land adjacent to the current high school would be useful in the future no matter what decision is made for future schools. The refinancing at a record low for the district will bring the district into a new low rate of 1.6% The district is currently at a financially strong position at the standard of having a ratio of tax base over student population because currently the district enjoys a 20% financing by the State of Texas. 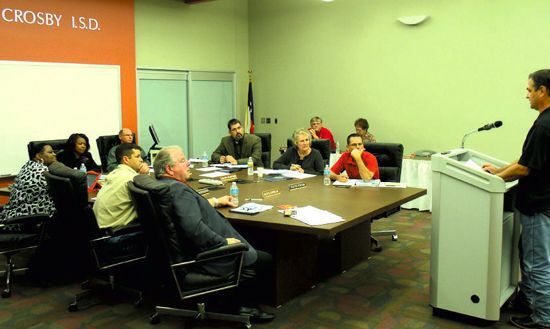 The board accepted donations from various entities to finance school activities and goals. The Delta Sigma sorority donated $3500 to the district to help students with special needs. Wal-Mart donated $50 gift cards to twenty different classrooms to be used for educational supplies. A 1924 Cornerstone discovered inside a warehouse of the district was devaluated of resale capability and will donated to the Crosby Historical Society for the commemoration of a building that has served as a high school and middle school. Again related to fixing to get ready the board allowed for possible re-imbursement of the general fund for capital outlay occurring prior to potential future bond financings. They are getting ready to spend money, if they borrow it to build something. As the Citizens Advisory Committee continues to weigh options for the district and tour the schools to view potential needs and opportunities the historic slow rate of growth for the district may come upon changes related to development in the next few years. The questions of how much new development and how soon will make the district that is currently in a comfortable but tight student to classroom size to a potential situation in which there are too many students for the schools to house. Dr. Hofmann on his debut on the board indicated that when he was on the Citizens Advisory Board the board took their suggestions and went a totally different way. 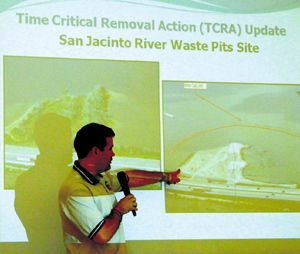 HIGHLANDS  Last Thursday evening, Nov. 15 the federal Environmental Protection Agency held the sixth in a series of Community meetings to update residents of the area on the status of the San Jacinto River Waste Pits, and to answer questions in this regard. The meeting was held at the Community Center, and although scheduled for 6:30 to 8:00, it actually ran longer because of interest from the audience to seek answers. A presentation or status report was made by EPA coordinator Valmichael Leos, and meeting facilitator Donn Walters. Leos reported that after a heavy rain in July 2012, and resulting high water in the river, some erosion of the containment cap on the west edge of the site had been discovered. The PRP (Potential Responsible Party) had been notified, and repairs were completed by August. An inspection of the cap indicated that there were no tears in the fabric over the waste pits, and no evidence of leaching or release of the dioxins underneath. In addition to the EPA staff, there were representatives of the state health department present at the meeting. Michael Tennant made a presentation of testing for toxins in the vicinity of the pits, and the results that were incorporated in a report. 63 fish and crabs were caught and tested in 2010, 2011, and october 2012, and showed continued amounts of dioxins and PCBs. Also present from the DSHS (Department of State Health Services) of the state of Texas was Dr. Richard Beauchamp, who had just completed a report entitled Public Health Assessment which took a large amount of data and analyzed it in regard to potential health risks from the toxins in the waste pits. Beauchamp was careful to explain that the assessment only studied effects of contaminants in the waste pits and the immediate earth and water adjacent to the site. Due to the unlikeliness that dioxins would travel through air or water tables, there was no evaluation of health effects in neighboring communities, based on the assumption that the dioxins in the waste pits would have no effect on these areas. He said that a health assessment of Highlands, Lynchburg or other communities could be made, but was not called for in this study. His Final Release of this Public Health Assessment will be used in the next steps of the EPA study, it was explained. Beauchamp studeied and reported on three basic scenarios that would threaten the public health. These were: one, direct ingestion in the mouth from transfer from a persons hands; two, dermal contact with a persons skin; and three, ingestion of fish or crabs from the river. His study indicated that long term exposure to these might cause cancers or other health risks. However, the report said that no adverse risks would be present from ground water, surface water, or air exposure from dioxins in the waste pits. It said that it could not judge effects of any off-site sand or sediment migration, due to lack of data. The timeline was explained by EPA calls for a Remedial Investigation report by Feb. 2013, a Feasibility Study by Sep. 2013, public comment period in Oct. 2013, and a Record of Decision early in 2014, which will select the final remedy for the waste pits and the entire site. During the meeting, the cap or TRCA (Time Critical Removal Action) was discussed it length. It was admitted that the solution had to be temporary, that the life of the cap would only be 7 to 10 years at best. Because of the damage on the west edge, a re-assessment of the design and installation is being asked for from the Corps of Engineers. Questions to be studied will include whether the design took into account barge traffic on the river, and subsidence that continues. This report is due by the end of November (draft) and a final report by March 2013. It was also reported that an inspection of the site on the south side of I-10, known now as the Southern Impoundment, has revealed that it is a separate dump from the Northern Impoundment site. A Risk Assessment for this site is due in several weeks, according to EPAs Gary Miller. Investigation so far has found that hydrocarbons (oil, enzene, etc) are present, and these are not from a paper mill, he said. However, the history of dumping and ownership of the site are still being investigated. Members of the audience were given a chance to ask questions of the EPA and DSHS. One concern voiced by several persons, including resident Pamela Bonta, was the high incidence of cancer related deaths in Highlands, and the possibility of a contaminated groundwater source affecting homes on well systems. She cited the poor health of 9 out of 12 of her neighbors, and her husband, too. She indicated that tests of their well water had indicated presence of heavy metals beyond acceptable levels. Dr. Beauchamp of DSHS said that there was no possibility dioxins or other contaminants in the waste pits travelling that far, and there was no relationship to their illnesses. Lisa Gosset, a University of Houston health professor, attending with some of her students, said that there seemed to be a Broad Health Based problem in Highlands and that what was needed was a comprehensive study approach, not just the waste pits. Sarah Davis wondered where this help would come from. She said that the Harris County Health Department had indicated that there were many pollution sources in the Highlands area. The Public Health Assessment by TX DSHS was made under contract to ATSDR, or Agency for Toxic Substances and Disease Registry, a federal agency that is part of the U. S. Department of Health and Human Services, headquartered in Atlanta, GA. Most of the current reports are available for viewing at Stratford Branch Library in Highlands. They are also on the EPA website, at http://www.epa.gov/region6/6sf/texas/san_jacinto/. CROSBY  One has to wonder when the 11th hour on Nov. 11, 1918 tolled the end of fighting in the War to End All Wars how endless fighting would be throughout the rest of the 20th Century and into the 21st, but here, we set aside a time to recognise those that answered the calls to defend their country. Last Friday and Saturday the David H. McNerney American Legion Post 658 and the Crosby Fairgrounds attracted volunteers from throughout the eastside of the San Jacinto River and Lake Houston to put together a series of special events for veterans. The incentive to recognise Veterans, as always, is that our freedoms are purchased on the service to our Country and the sacred honor of those that serve in uniforms. As the War on Terror draws to a close the need for continuity for respect for veterans seems evident. The Eastside Veterans Celebration  Warriors Past and Present was accomplished by contributions of individuals like Richard Amador that had the vision, Connie Russell that made the quilt that drew so many raffle ticket purchasers, the Crosby Fair & Rodeo that donated the Fairgrounds, the American Legion Hall and numerous others but mostly by a greatful community that stands behind our country and fighting forces. 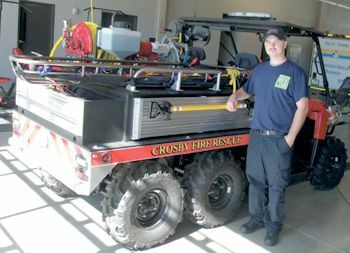 The parade on Saturday went into the quiet Nelson Subdivision for over a mile long but the public turned out in throngs to view the local specticals of vehicles, first responders and the many representatives of the armed forces. A substantial list of contributors and cooking teams was placed prominantly both within the American Legion Dining Hall and at the Fairgrouns Pavillion. Opening ceremonies at the American Legion Hall brought special guest speaker Silver Star recepient Lt. Col. Rick Sauer to the podium to speak of the experience of those that serve and with Col. Sauer came others that served at Poli Doc, South Vietnam when Crosby David Mcnerneys services netted him the Congressional Medal of honor. Great men are those that answer great duty. This community contributed its sons to duty and affirm that service as sacred and honorable. Veterans Day recognised the end of fighting. CROSBY  Scott Stephens asked the University Interscholastic League Legislative Council (U.I.L.L.C.) on Oct. 19 to require Electrocardiograms (E.C.G.) 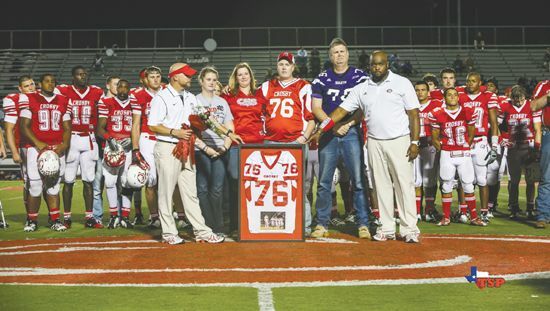 for high school football players and that they be read by cardiologists because if that had been the rule, his son, Cody, would be alive today. It was on Cody Stephens birthday that Scott made his speech to the board that assists in governing issues for the U.I.L. It is the U.I.L. that requires physicals for athletes today but the system is based upon a 1950s model of medicine, Stephens makes the case that medicine has progressed over the past 50 years. If you know Scott, you know he can make a case but to know that the tests can be administered for as low as $15 and that already this year, a Huffman student says the test saved his life, and following surgery, that student, Chris Aguilar has returned to the football field, then the case against performing a heart screening seems weak. One of the great things about men of character is if you ask them what the other side is they will tell you. Because they know both sides going into the argument. Scott says that the U.I.L. Medical Committee may be asking for more study of the situation because of the possibility of false positives keeping a potentially great athlete from playing a season. During his address Stephens said, The U.I.L. website says the risk of sudden cardiac death is only 1 in 300,000. But the real number is 1 in 88,000 students. The Cypress ECG Project will tell you from their own 9-year history that 1 child in 8500 has required corrective heart surgery. Studies have shown that the risk for sudden cardiac death in athletes is 2.5 times greater than the general population and boys are 5 times more likely to die than girls. The Texas Heart Institute told me this week that we are a pace to lose 50 students between the ages of 12 through 18 in Texas this year. Stephens would also tell the U.I.L. Council, The current school physicals catch about 1% of heart issues. Adding screenings can improve that to 98%. After screenings about 4.5 percent of students are recommended for follow-up with a cardiologist. If each of you has 2 kids then by the stats 3 of them may need their heart looked at closely. Is it your child? Mine was one in 88,000. The question is open why does the U.I.L. need to mandate this low cost and quick test. Huffman ISD made the decision to do E.C.G.s 2 years ago during their physicals exams. The school nurse was catching a little heat from some parents that this wasnt necessary. After all, it wasnt required by the U.I.L.. She called the school nurse, in neighboring Crosby to do it also. Stating, if we both do this potentially life saving test maybe the heat will be less. The school nurse in Crosby agreed, but for whatever reason, Crosby didnt chose to follow through. So my son, who desperately needed the tests, didnt even know it was an option or available. The Star-Courier will continue to follow the developments of this investigation as to what if any actions will be taken by school districts and the State of Texas regarding heart monitoring. But in important Harris County offices, voters decided to return Adrian Garcia as Sheriff, and Ken Jones as Pct. 3 Constable. Vote percentages were Garcia 53% vs Guthrie 45.2%, and Jones 63% vs Cruzan 37%. Jack Cagle was re-elected as Pct. 4 Commissioner and El Franco Lee as Commissioner in Pct. 1. In the race for County Attorney incumbent Vince Ryan was re-elected with 51.5%, vs Robert Talton with 48.5%. Mike Anderson won the race for District Attorney, with 52.4% of the vote for this county office over Lloyd Oliver. Mike Sullivan was elected as Tax Assessor-Collector with 48.9% of the vote. Ann Bennett had 48.7%%. In the national race for president, Obama had 303 Electoral College votes at press time, vs 206 for Romney. Only 270 are needed to win as president. Television networks declared Obama the winner at 10:15 Central Time, after the Ohio results were available. The irony was that Romney led in the popular vote most of the evening, and when this announcement was made. In state of Texas races, Ted Cruz was elected Senator to replace Kay Bailey Hutchison, with 57% of the vote vs 40% for Paul Sadler. Ted Poe, Kevin Brady, Sheila Jackson Lee, and Gene Green were returned as Congressmen. Dan Huberty and Wayne Smith, representing this area, were returned to the State Legislature. One irony in the State Senate race was that deceased candidate Mario Gallegos received 70% of the vote, over opponent R. W. Bray. This means that the governor will have to appoint a replacement, and eventually call a special election. Speculation is that either Carol Alvarado or Sylvia Garcia might be appointed to this Democratic seat. Barry Smitherman was re-elected as chairman of the important railroad commission, the misnamed agency that controls oil and gas production in the state. Smitherman was originally from Highlands. Mike Parrott ran unopposed for Justice of the Peace and was re-elected. The City of Baytown had 19 amendments on the ballot, and all were passed except #2, which called for a salary increase for the mayor and councilmen. All the bond issues passed, which means Houston Community College, Houston ISD, and the City of Houston will have funds for new construction, and most likely will raise taxes to pay for them. METRO passed a proposition that will give 1/4 of its sales tax revenue back to local cities for mobility improvements, and keep the rest for buses and debt repayments. Crosby had three board positions up for election this time. In Position 4, David Porter defeated David Shaver with 62.5 percent of the vote. In Position 5, incumbent Carla Mills Windfont received 81% of the vote, over Will Locke. In position 7, challenger James Hofmann had 64% of the vote, vs Gerald Blankenship with 36%. In Huffman, school trustees Dean Tinnin, Charles Bardwell, and Matt Dutton were returned without opposition. For Position 7 Patrick Keith won with 53% vs Guy Smith with 47%. Keith had 1855 votes, and Smith had 1641 votes. Harris County Clerk Stan Stanart stated that 1,188,734 citizens voted, out of a total of 1,942,566 registered, for a 61.19% turnout. This figure is considered high for a general election, indicating the great interest in national and local races.